Palafrugell is known for being the town in the region with the busiest commercial activity on Sunday mornings. 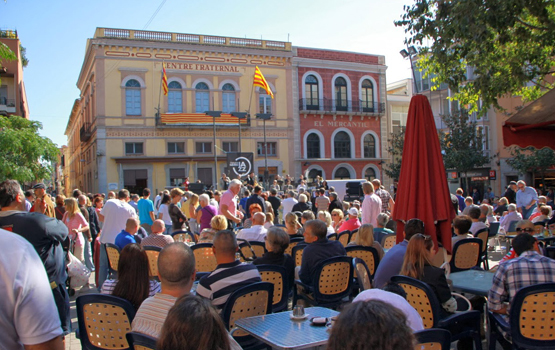 Palafrugell is known for being the town in the region with the busiest commercial activity on Sunday mornings. From 8am, stands start filling the whole length of Pi i Margall street for the weekly market as well as some neighbour streets, filling the town with fruit, vegetables, meat, fish, shoes, toys… and many other goods. Besides, most of the town’s shops stay open on Sunday until 1.30 pm. Have a look at the assortment of goods on offer! After strolling around the market and the commercial area, take a rest and try a typical Sunday aperitif in one of Plaça Nova’s terraces and watch locals and visitors alike enjoying the Sunday atmosphere. Don’t leave without going into the Centre Fraternal, located in Plaça Nova, on Sant Sebastià street corner. It is a historical building that has hosted cinema, theatre, social gatherings, afternoon balls, children’s activities, concerts, etc. It also hosted Palafrugell’s first public library open to the public in 1905 that can still be visited today (upon reservation). The bar area transports us to the 19th century with a casino atmosphere! After the appetizer you can continue to satisfy your appetite at one of the restaurants located on each side of the road that crosses Llofriu. After lunch, take a walk around the old town and you will find the Cultural Centre Bassa Rocas, the former school of Llofriu, that today is the starting point of the Americanos route.